Lurking in a dark, water-logged temple lays a spirit of nefarious intent, a dark doppelganger that twists a heroic image into something villainous. 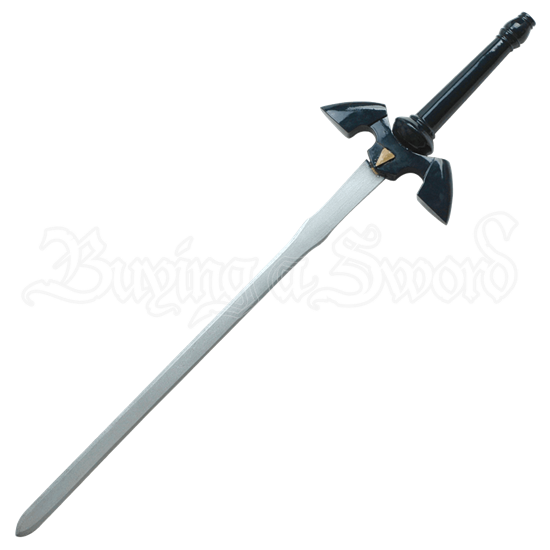 And now, you can wield this shadows sword safely, by wielding the Wooden Blue Heros Sword. One the sword of a goddess, now this blade is dark and twisted, although its once-elegant features still remain. This wooden sword features a shape worthy of a hero, including a long, steel-grey blade and a wing-tipped guard set with a single golden colored triangle at the guards center. The grip is smooth and inky-Blue in its coloration, allowing the eye to only note the pommel by the change in shape and swell. This sword is made entirely in wood, and it comes complete with a wooden scabbard decorated with vibrant gold lines. All heroes have a darker side, and with this Wooden Blue Heros Sword, you can not only release your favorite heros evil shadow, but you can wield its sword safely whenever you take on his look or his style.